Motorola two way radio walkie talkies are available as small and lightweight devices perfect for running a campus food court and as heavy duty rugged radios able to work with repeater systems to communicate miles apart. 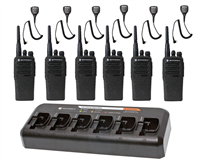 Whether you need to communicate throughout one school building, monitor sporting events and arenas, or cover an entire campus for maintenance, we have a two way radio for you. Two way radios will improve response time in emergency situations, monitor large crowds effectively at campus events, and keep the campus clean and in good shape with clear communication between maintenance staff members. Two way radios offer different channels so you can separate employees into different groups if they only need to communicate to a select few. If you aren't sure which radio you need or how two way radios can enhance your communication and security, just give us a call!